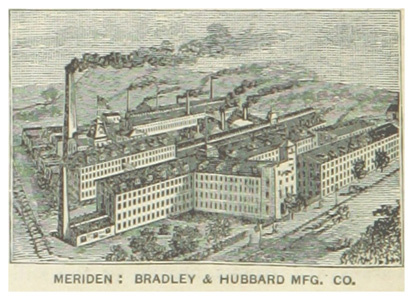 This special focus of articles explores historical Meriden design and Tremaine art, both of which are featured in national and sometimes international museum collections. > R.J. Preece and Smithsonian curator Richard Stamm discuss the worrying state of B&H documentation related to their 88-year product design history. Also learn how you can make a significant, low-cost contribution to the product design history of the famed company. > Via YouTube, architectural historian Brian Cofrancesco offers a one-hour lecture about the former Meriden mansion with parlor room now on view at the Metropolitan Museum of Art in New York. Designer Paul Butkus offers a synopsis and adds key historical information and an extensive bibliography discussing events leading up to its curious demolition. > Meriden native Katharine Zatkowski reviews Diane Tobin’s book (2014) which spotlights the development of the influential 19th century glass company that won recognitions in Paris and Sydney, and a grand Victorian house with "stained glass and gilt and frescoed ceilings almost throughout". > Culturally-interested Meriden high school students should be thoroughly informed about the art / design soil beneath their feet, before going off to college. This proposed Saturday seminar series aims to inform, deepen understandings, and empower the next generation of historical Meriden design researchers, book authors, article writers and leaders. 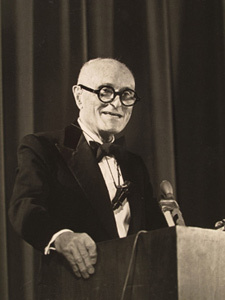 Photo of Philip Johnson speaking at the podium during a lecture introducing the exhibition The Tremaine Collection - 20th century masters: the spirit of modernism (1984). Photo: Wadsworth Atheneum archive, Hartford, CT. Used with permission. > Exclusive: In this lecture, architect Philip Johnson speaks at the unveiling of the exhibition The Tremaine Collection - 20th century masters: the spirit of modernism (1984). Johnson details his admiration for the art collection, rooted in downtown Meriden. He also talks about the collaborative working relationship with the Tremaines regarding their little-known architecture projects— and the colorful Chick Austin, former director of Hartford’s Wadsworth Atheneum. This lecture transcript has been published for the first time at the request of artdesigncafe. > In interview, D’Ambrosio talks about her 2005 exhibition Brass Menagerie: Metalwork of the Aesthetic Movement at the Munson-Williams-Proctor Arts Institute in Utica, New York. She discusses very interesting designs by Bradley & Hubbard and the Charles Parker Company. > By putting out-of-copyright trade catalogues online, new historical Meriden design documentation becomes more easily accessible to everyone. And new discoveries await. Thank you Toronto and archive.org!